Ground Mounted « Global Market Insights, Inc. Many of the market players are engaged in collaborations with research institutes to bring about innovative technologies that will enhance the industry expansion. Growing investments in R&D activities, flexible integration, and better efficiency will boost the demand for thin film technology integrated products. In 2016, thin film covered more than 20% of the revenue share of technology segment in solar PV module market. The noteworthy participants in solar PV module market are First Solar, Canadian Solar, Trina Solar, JA Solar, Hanwha Q CELLS Co., Jinko Solar, SunPower, Yingli, ReneSola, Moser Baer, SFCE, Shine Solar, and Lanco. Growing industrialization across the globe will fuel the need of renewable energy. Favorable government initiations in terms of financial support will prompt industry giants to adopt solar PV modules to enhance the growth of Solar Energy Market. Ground mounted systems are being deployed increasingly across the utility and commercial sectors subject to their numerous benefits. The ground mounted segment will exhibit an annual growth rate of more than 7% over the period of 2017 to 2024. The governments of various countries have lately been making huge efforts to enhance the grid connectivity of their nations. 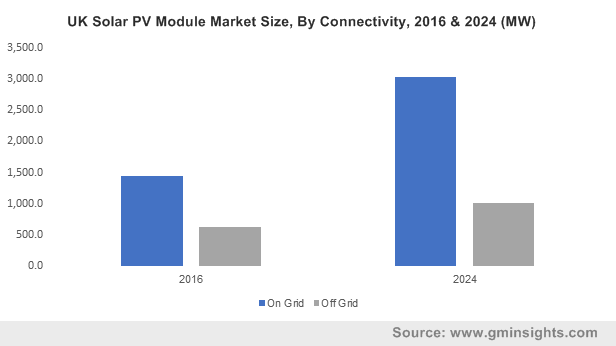 Speaking of which, the on-grid segment dominated the connectivity landscape of solar PV module industry by accounting for more than 55% of the revenue share in 2016. It is expected to record substantial growth rate over the coming timeframe. Rural areas have witnessed a heavy deployment of micro-grids to fulfill the escalating need of off grid electricity, subject to which solar PV module market from off grid connectivity segment will generate a significant revenue over the coming seven years. To accomplish the need of sustainable energy, the U.S. has been installing micro grids on a large scale. U.S. solar PV module industry will register a CAGR of more than 6% over the coming years of 2017 to 2024. The attributing factor toward the market growth is deployment of stringent rules and regulations to control GHG emissions along with huge investments in power plants to increase the grid capacity. To reduce carbon emissions in the environment, the government has been promoting the usage of roof top mounting system. Government support and favorable subsidies will propel solar PV module market from roof top mounting systems. The Asia Development Bank recently granted a subsidy of US 500 million for the development of roof top systems. Escalating installation of these systems across the residential sector will also influence the product demand. Solar PV module industry from the residential sector collected a revenue of USD 4 billion in 2016 and is predicted grow lucratively over the years ahead. Monocrystalline products are also deployed across this sector, subject to which monocrystalline solar PV module market will grow at an annual growth rate of more than 6% over the period of 2017 to 2024. Additionally, the surging need to maintain energy efficiency will augment the product demand. China covered more than 60% of Asia Pacific solar PV module market share in 2016 and will generate considerable revenue over the coming seven years. Shifting preference toward the adoption of renewable technology is likely to impel China solar PV module market. Market players are focusing toward strategies such as product innovation and differentiation to gain more profit. The efforts of these companies coupled with government norms to promote clean energy will suitably impel global solar PV module market. This entry was posted in Sustainable & Smart Technologies and tagged A-Si, Amorphous Silicon, Cadmium Telluride, CDTE, CIGS, Copper Indium Gallium Di-selenide, Crystalline Silicon, Global Solar PV Module Market, Ground Mounted, Monocrystalline, Off Grid, On Grid, Polycrystalline, Roof-Top, Solar PV Module Market, Solar PV Module Market Report, Solar PV Module Market Size, Thin Film.